Free alphabet scavenger hunt. Winter alphabet scavenger hunts. Winter themed pictures on uppercase and lowercase letter cards. Kids can use letter cards to actively engage with letters of the alphabet. Try out these free alphabet scavenger hunts! Check out more alphabet scavenger hunts here. Use the letter cards in a variety of ways. This game is appropriate for a school or homeschooled setting. It is appropriate for preschool and kindergarten aged students, as well as, for special education instruction. This game gets kids up and moving and prepares them for "Write the Room" activities. I've included blank cards which can be used for students' names, sight words, etc. You can use the blank recording sheets to work with your customized cards. Students will search the room to find upper or lowercase letters. Students will trace or write the letter when they find the matching letter. Students can use a swatter with a hole in it to catch the letter. Students can sort upper and lowercase letters on the sorting mats. Sorting mats are included with and without a model, so you can meet the needs of your students. See my blog, Differentiation Station Creations, for more ideas! 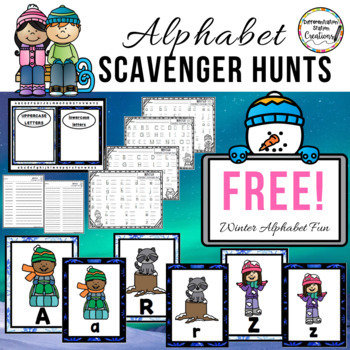 If you loved "Free Winter Alphabet Scavenger Hunt", you need to take a look at these games and activities!